This online Direct to Consumer (D2C) company added Octane AI to their Shopify store and Facebook page to automatically follow up with customers and recover abandoned carts. As they said, "this is the best product we've ever used." 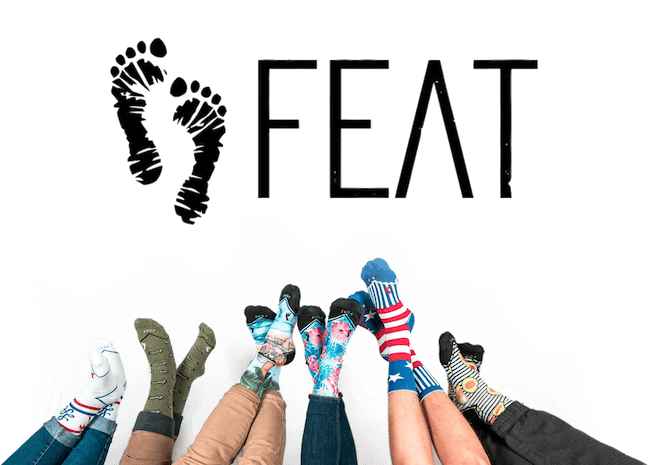 The two founders noticed people like crazy socks. Within their first year, they sold 20,000 pairs of socks from their backpacks. They moved to Los Angeles to further grow their brand. Because of their success, the founders were named to the Forbes 30 under 30. FEAT Socks' core customers are people who love crazy socks. They constantly introduce new products to keep things fresh and exciting. They were skeptical at first, but setting up Octane AI only took three clicks. After that, the numbers spoke for themselves. They implemented a Facebook Messenger bot for their Shopify store that automatically followed up with customers when they didn't complete an order. Within two weeks, they generated 5x more abandoned cart revenue with Facebook Messenger, with a subscriber list that's one-tenth the size of their email list. "Since going live two weeks ago, Octane AI has increased abandoned cart revenue by 5x. It only took a few minutes to setup with three clicks. We see huge open rates of 70% to 80% and this is the best product we've ever used. If you're in ecommerce, you NEED Octane AI!"